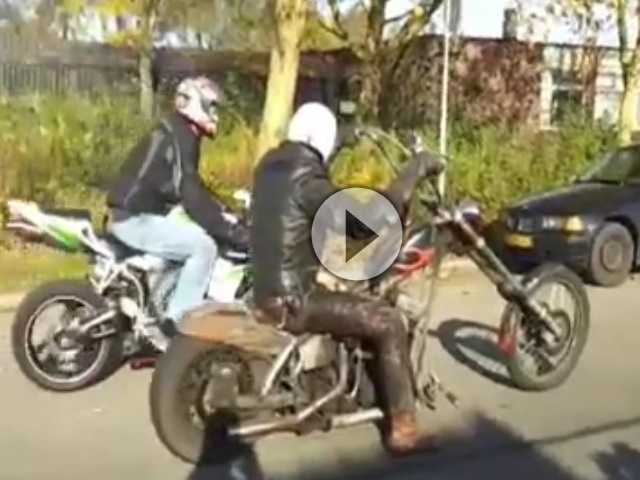 Hildos Harley Ratbike Chopper vs. Honda CBR1000RR Fireblade - dreimal abgeledert geil! Der Schluss ist geil! Dragrace between Hildo, the owner & builder, of a 25 year old Harley Ratbike Chopper and the owner of a 170hp+ Honda CBR1000RR Fireblade. This man has considerable experience racing circuits but this ain't no circuit! He was sure this race would be a piece of cake against this rolling piece of Harley crap, then things turned bad... Enjoy! !